Data East's makes its own Highway to the Danger Zone. It was the mid-80's, Jet flicks were the sensation of the moment. With films such as Top Gun and Iron Eagle leading the charge, the market was overflooded with jet-related stuff. From the usual toys and hobby kits to clothing and eyewear. Kenny Loggins' hit song Danger Zone and Cheap Trick's Mighty Wings were played anytime on the radio, and everyone wanted a Ray-Ban just like the one used by Tom Cruise or even an aviator like jacket. Gaming had its hook on this sensation, just like it did with other things like westerns and ninjas. Sega's After Burner games are a great example, but also, there's a shooting game made by Data East which catches some of this jet-flick vibe. 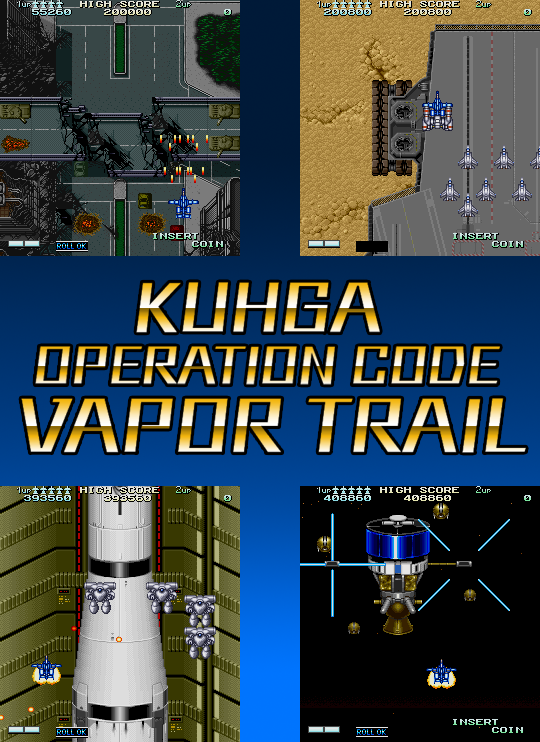 I'm talking Vapor Trail: Hyper Offence Formation, also known as Kuhga: Operation Code "Vapor Trail". The game offers three types of aircraft with different configurations. XF/AV-01 SILPH: This Delta-wing aircraft combines the body frame of the Grumman F-14 Tomcat with the wing configuration of the Dassault Mirage and the IAI Kfir. It is the basic "balanced" fighter with average strength and speed. It has a spread-type shot that fires in a "curved" curtain pattern, addressing the problem of the basic frontal fire of most games. XAV-02 VALKYRIE: Of the three jets, this one is not an original design since the XAV-02 is just a rename of the Fairchild Republic A-10 Thunderbolt II. This plane is the Power-type of the game that relies on strength, sacrifying speed. It's spread shot is more "frontal" than that of the Silph. XFV-03 SEYLEN: This Forward-Swept wing aicraft resembles a combination of the General Dynamics F-16 Falcon with a forward-swept wing configuration based on the Grumman X-29. The Seylen is the Speed type fighter that focuses more on fast movement than power, making it a weak ship. But it has a back shot which was a revolutionary feature back then. While the aircraft has their own weapons, they're provided with additional firepower via a capsule that changes its weapon type after being shot. VULCAN: Marked with the "V" letter. This is the default weapon of your jets. BOMB: The "B" letter. It changes the Vulcan (or any weapon selected) with a frontal bomb attack. This is the power type weapon as it generates an explosion upon impact that damages nearby enemies and eliminates bullets. MISSLE: The "M" letter. This is the Homing-type weapon that fires missiles in multiple directions that chase their targets. The only problem is the minimal damage they cause. DEFENDER: The "D" letter. Fires rings in 8 directions as your "All Range" weapon, although its quite strong, is almost useless since it's not a rapid-fire type weapon. The weapons aren't just all. There's an item called Sub-Unit that adds extra equipment to your aircraft. SUB-UNIT ON SILPH: The XF/AV-01 replaces the vulcan with a Twin shot that fires in diagonal directions in a "\ /" pattern. It's kind of tricky to hit something in front of you due to the angle, but the shot swings with the ship's movement, allowing some additional range. SUB-UNIT ON VALKYRIE: With the Sub-Unit equipped, the XAV-02 shoots a twin flame blast of great power in a frontal direction, causing mega-damage to your enemies, and even bosses. With the perfect play, a boss battle will be over in seconds. SUB-UNIT ON SEYLEN: The XFV-03 changes its back shooting for a more frontal-based attack consisting of 6 frontal bullets and two rear shots. However, the frontal bullets appears from the sides and then they go frontal. Learning how the bullets are fired is helpful to deal in some situations. The Sub-Unit can be lost if you're killed or you self-detonate it. Yeah, you can self-destruct your Sub-Unit by pressing the Roll Button, while the Roll Button is your defensive skill that makes you immune to enemy fire for a moment, the Sub-Unit self-destruct is a bomb-attack that inflicts damage to all enemies on screen. Using the Roll isn't just an ability you can rely on any moment, you have to know when and where to use it since it takes time to recharge after its use. In graphics, the game is themed in one specific theme: The Military. Fighter aircraft and ground vehicles like tanks are predominant in this game. Like so, the jet design features additional animations like the "airbrake" when you move the ship down, and in the XAV-02 the engines move in a very similar way to the Harrier VTOL engine (something that the real A-10 can't). Although military designs are the main aspect of the game, the game takes a turn into Science Fiction adding mechas in Stage 3 and a turn into Fantasy in the boss battle of Stage 3 as it involves a battle against an armed missile and a satellite in space. Musically, it's obvious that Top Gun influenced this game, as its rocking guitar riffs are reminiscent of songs like Danger Zone and Mighty Wings, which this style is, in my opinion, a definition of the 80's soundtracks. This single guitar wailing track will be all what you'll hear throughout your gameplay. The music only changes when it's boss time, although they also re-use the same song, there's a couple of instances where they use other themes, and that's Stages 3 and 4. Vapor Trail was ported to the Sega Genesis for both US and Japan. Although it is considered a faithful port, there's things cutted-off from the original game. Starting off with the removal of some animations in the enemies, like the spider-tank from Stage 2 and the removal of weaponry in the rocket of Stage 3, but the worst butchering of all was Stage 5, as the "Descending tunnel" and mobile platform boss were removed and replaced with a "above the clouds" section and a boss battle with a recolored Stage 1 boss featuring different attack patterns and greater damage tolerance. The gameplay has its up and downs in the console version. Starting with the addition of an Auto-fire button which comes in handy during your gameplay and the inclusion of a third life point. As for the downs, the game includes and R-Type like start back after dying, strangefully it only happens if you die before reaching more than the half of the stage. Some graphic aspects are different from the original arcade. For instance, in Stage 1 the plaza there's a "neko" painted on the ground and the Statue of Liberty was removed. I guess they wanted to make the first stage to look more like a japanese city like Akihabara or Shinjuku rather than New York. The stationed planes in Stage 2 have different colors, and the missile launch tunnel is blue instead of yellowish brown. Musically, Vapor Trail manages to keep the arcade accuracy despite the console's sound limitation emulating the original guitar riffs and keeping most of the voice samples. Very few Genesis games did that. After Burner II and Out Run for example, where they sacrify the graphic quality to focus on the sound accuracy. It is possible that Telenet and Data East did the same in Vapor Trail. FUN FACT: OPERATION CODE "TRIVIA TRAIL"
- Vapor Trail was the third shmup to feature modern military aircraft in space combats, being Sega's Sonic Boom and Konami's A-Jax/Typhoon the first and second ones with an F-15 in space destroying a satellite boss and an F-14 destroying a space fortress. - Like in Sonic Boom, Vapor Trail also has the space battle in stage 3. - This idea of "Jets in space" would be seen in later shmups such as Carrier Air Wing, Aero Fighters and Strikers 1945 III. - The "Jet VS Satellite" battle will be included in Carrier Air Wing as the final boss of the game, and in Strikers 1945 III with the Stage 6 random bosses Cross Blade and Geo-Bite. - The concept of a land-moving aircraft carrier is technologically possible (even with the 80's technology), since it could use some concepts of the NASA Crawler Transport used on both Saturn V and the Space Shuttle, only adapted to an aircraft carrier. Although it would need really powerful engines to move with an average speed of 30KPH. This concept also appeared in Kaoru Shintani's Area 88 manga. - The land-carrier also appeared in Capcom's Area 88/U.N. Squadron. Like in Vapor Trail, the battle also takes place in the desert. - Despite its simplification, the Genesis version of Vapor Trail was very praised for its accuracy to the arcade, mostly on the music. - The cover art of the Genesis version depicts an F/A-18 Hornet instead of any of the aircraft used on the game. - The Sub-Unit equipment concept and functionality is very similar to the Brigandine from the Thunder Force series. Both units sacrify the ship's default weapons in favor of new-but-stronger ones. - The "Delta Wing, Wide Wing and Forward Swept Wing" 3-ship variety will be seen in Raiden V with the ships Azuma, Spirit of Dragon and Moulin Rouge. - The song "Snazin Dog" from Doctor Rhino uses sounds from Vapor Trail. - The Genesis version of Vapor Trail was featured in Nickelodeon's show Nickelodeon Arcade in the "Video Game Challenge" segment. When it comes to fly "Up there with the Best of the Best" in shmup classics, Vapor Trail is among that Elite of old-school shmups. Something that we need nowadays on the Arcades.